During November and December 2018, the Company commissioned Calgary, Alberta based Earth Scan Technologies Ltd. to complete drone and heli-borne airborne magnetic geophysical surveys totaling 932 line-km over an area totalling approximately 3,400 hectares at 100 metre line-spacing. The claims in part overlie rocks of the prospective Lac Dore layered anorthosite-gabbro intrusive complex (LCD), which hosts the Black Rock Metals Inc. (Blackrock) development-stage Southwest and Armitage iron-titanium-vanadium (Fe-Ti-V) deposits; in addition to the exploration-stage Vanadiumcorp Resource Inc. (Vanadiumcorp.) and Vanadium One Energy Corp. Lac Dore and Mont Sorcier Fe-Ti-V projects, respectively. Magnetite Fe-Ti-V deposits of the LCD are coincident with a strong positive northeast trending linear magnetic geophysical anomalies within both the northern and southern fold limbs of the Chibougamau Anticline. Mineralization within the adjacent properties is not necessarily indicative of mineralization present with the Company's Chibougamau Vanadium Prospects. The results of the Company's airborne magnetic geophysical survey define an approximately 9 km northeast trending linear magnetic anomaly coincident with the southern margin of the Lac Dore anorthosite on the north arm of the Chibougamau Anticline. A second parallel linear magnetic anomaly occurs in the easternmost area of the claims along the southern limb of the Chibougamau Anticline within rocks regionally mapped as Lac Dore anorthosite. These and other linear positive linear magnetic anomalies defined by the Company's airborne geophysical survey warrant ground follow-up to establish the nature of the anomalies, and if they host layered magnetite-bearing anorthosite-gabbro rocks similar to those that within the adjacent Blackrock and Vanadiumcorp Fe-Ti-V deposits. 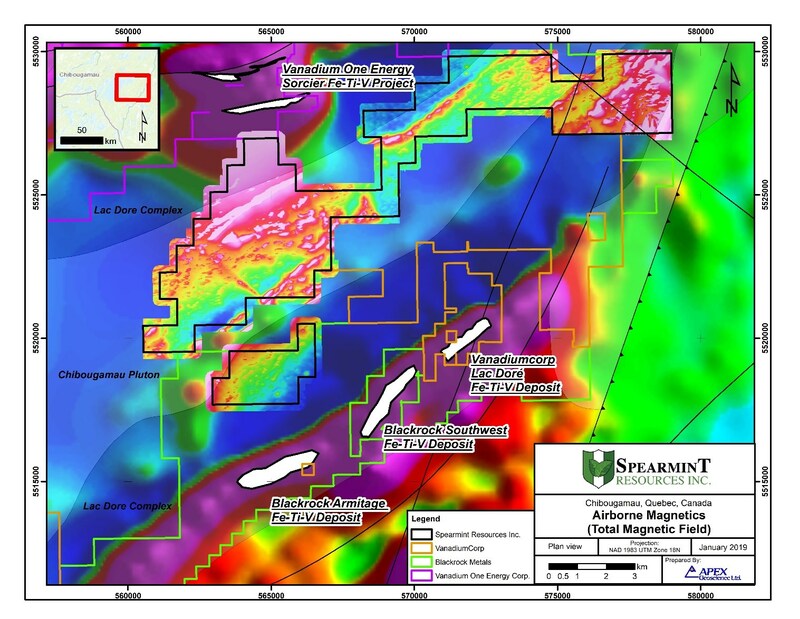 James Nelson, President of Spearmint, stated "Having already uncovered one potential high priority target to date, we are very encouraged that the remainder of the airborne data shows the existence of further high priority magnetic anomalies, including one that measures 9km in length, throughout our near 14 thousand contiguous acre Chibougamau Vanadium prospect in Quebec bordering BlackRock Metals. A follow up work program is being planned and management is expecting to have crews on the ground shortly to further investigate these magnetic anomalies discovered from the data produced by this inaugural airborne magnetic survey. We are very excited to determine whether our anomalies will be vanadium bearing like that of our neighbour BlackRock metals." Kristopher Raffle P.Geo., Principal, of APEX Geoscience Ltd., a Qualified Person as defined by National Instrument 43-101 reviewed, verified, and compiled the data reported herein specific to the Chibougamau Vanadium Prospects. Mr. Raffle has reviewed and approved the scientific and technical disclosure in this news release. Spearmint's current projects include the 'Chibougamau Vanadium Prospect' comprising of 13,985 contiguous acres bordering the vanadium deposit of BlackRock Metal's (private) Ilmenite vanadium project and Vanadium One Energy Corp. and Spearmint's 'Clayton Valley Lithium Prospects' in Nevada comprising of two claim blocks totaling 800 acres bordering Pure Energy Minerals & Cypress Development Corp.
Spearmint's current projects also include a portfolio of prospects in the Golden Triangle of British Columbia; the 'Golden Triangle Gold Prospects' comprising of six separate claims blocks totalling 9,157 acres bordering GT Gold Corp, the 920 acre 'NEBA West' & 6,803 acre 'NEBA' Gold-Copper Prospects bordering Aben Resources Ltd, the 'Henry' Gold-Copper Prospect consisting of two contiguous claim blocks totalling 1,989 acres in the direct vicinity of Golden Ridge Resources Ltd., and the 21,587 acre 'EL North' Nickel-Copper Prospect is a contiguous land package of six claims in the Eskay Creek Camp bordering Garibaldi Resources Corp. Spearmint's other projects in British Columbia include the 'Gold Mountain Prospects' comprising of three separate claim blocks totalling 1,245 acres bordering Barkerville Gold Mines, the 'Safari' Copper-Gold Prospect consisting of 9,007 contiguous acres located in the northern Quesnel Trough in North-Central BC directly bordering Serengeti Resources Inc., and the 'Hammernose' Gold Prospect consisting of 5,140 acres directly bordering the strategic alliance between Westhaven Ventures Inc. & Sable Resources Ltd. in the Spences Bridge gold belt located in Southern British Columbia, Canada.